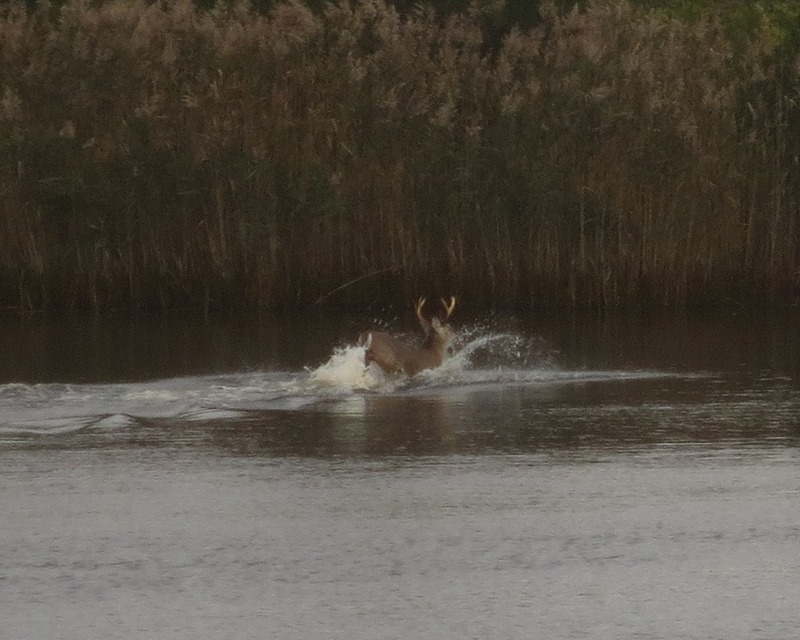 2013-10-31–Sometimes you see the most unexpected things! 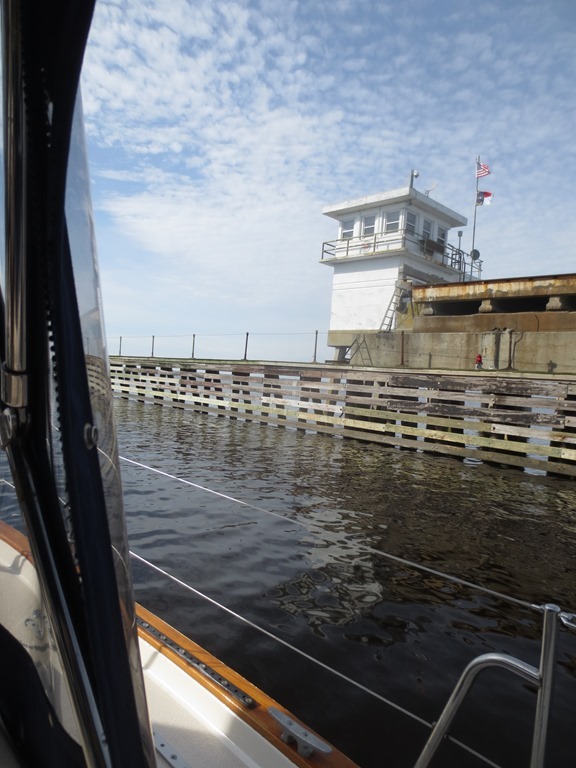 Magnolia and crew crossed the Albemarle Sound from Elizabeth City and made anchorage in South Lake off the Alligator River. 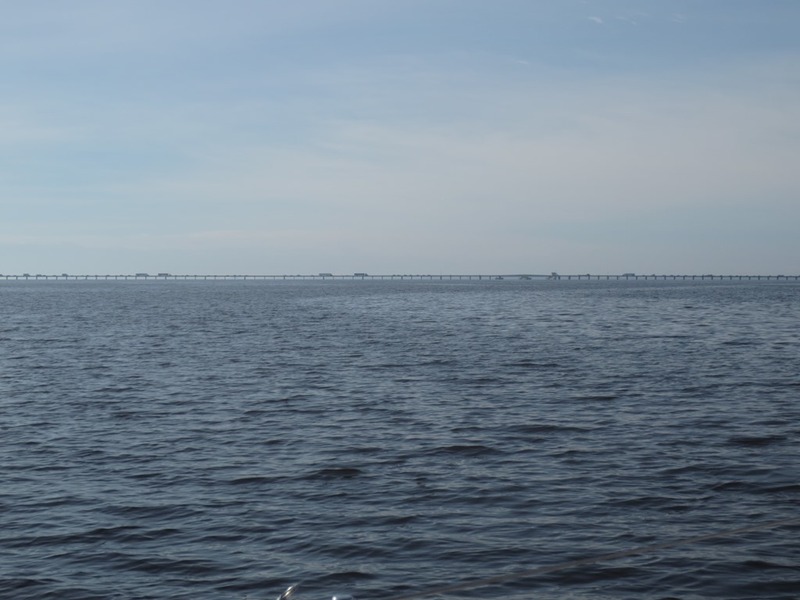 It was a lovely place, we saw no other boat or person for 24 hours Keep in mind we are in the midst of migration season so to have an anchorage to ourselves you know we must have been off the beaten path. 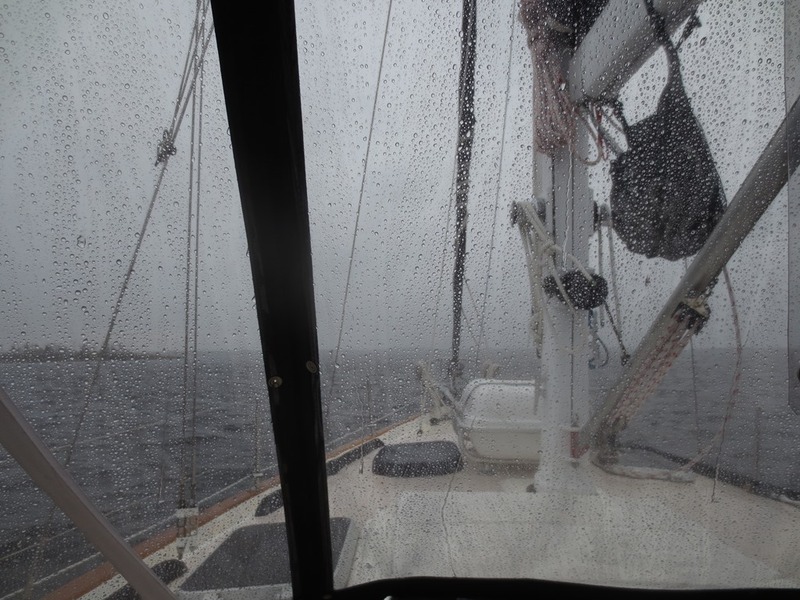 It was a challenge to navigate our way in but it was lovely. 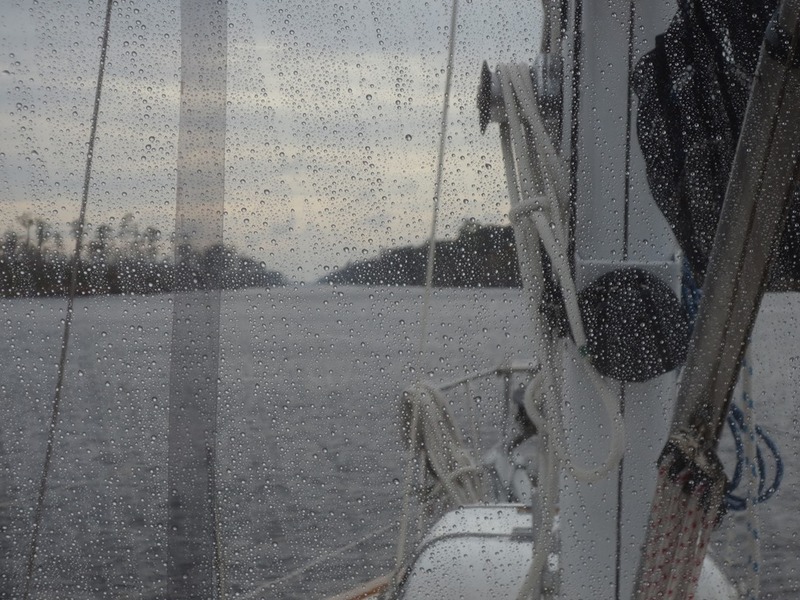 We intended to stay in South Lake through the approaching front cycle we are entering but with a weather window to move further south and the words of my friend Greg in my ears, “make hay when the sun shines” we quickly got Magnolia moving south. 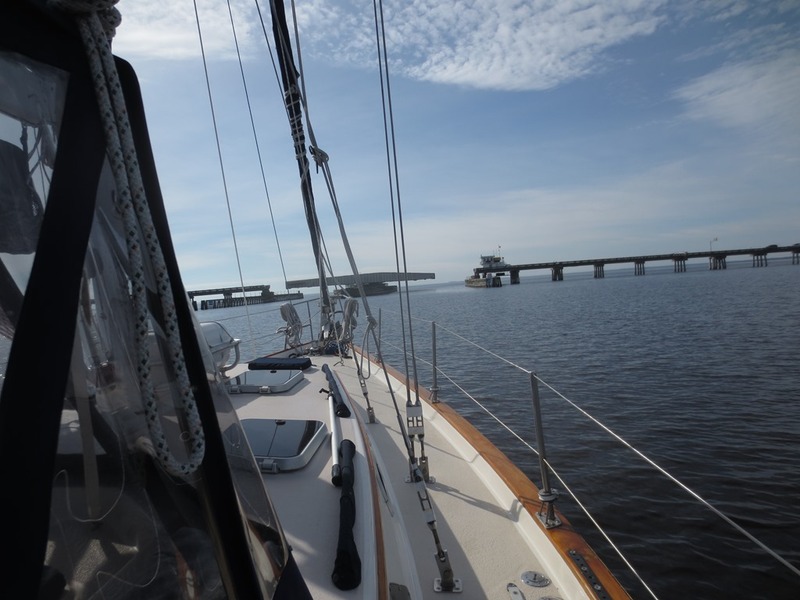 Soon after getting underway we approached the Alligator River Bridge. 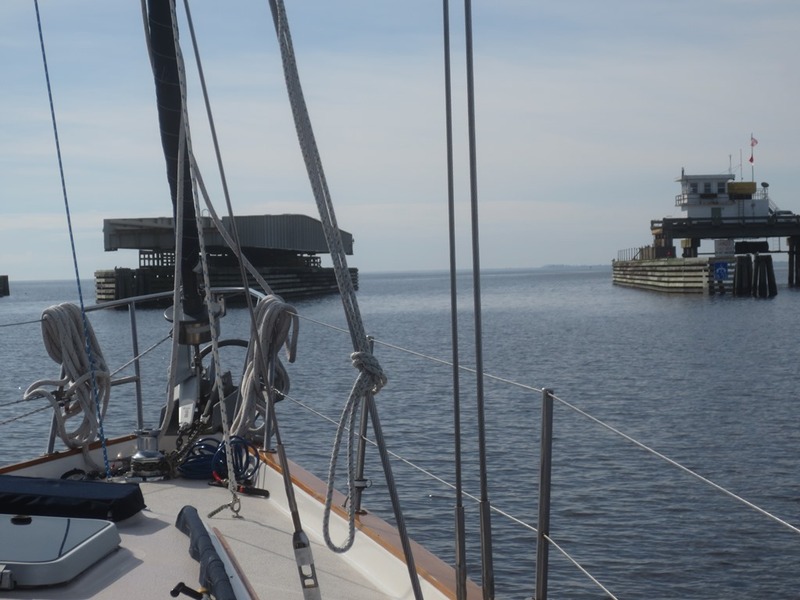 Below is what we see when closing in on a bridge. The Admiral usually does the radio talking since it seems a female voice generally gets a better response and this was no exception. 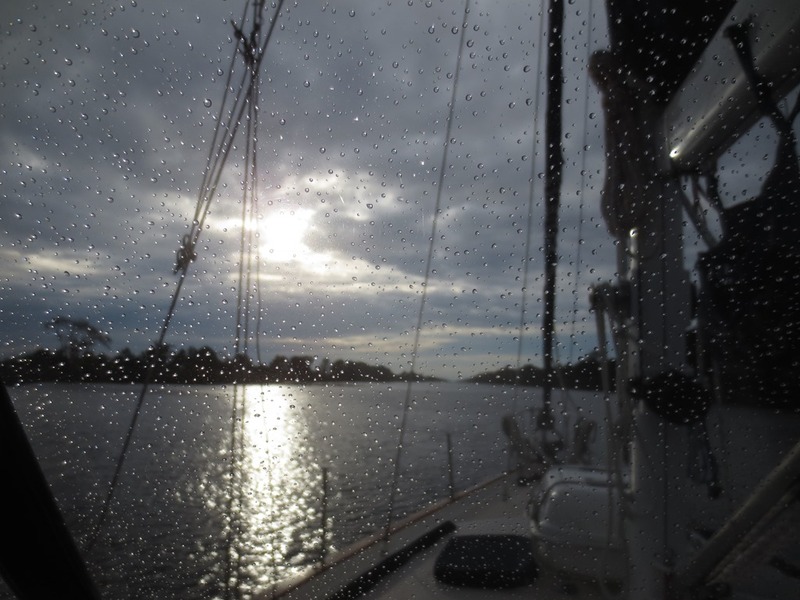 Annette called the bridge on the VHF radio and of course we got a quick opening. 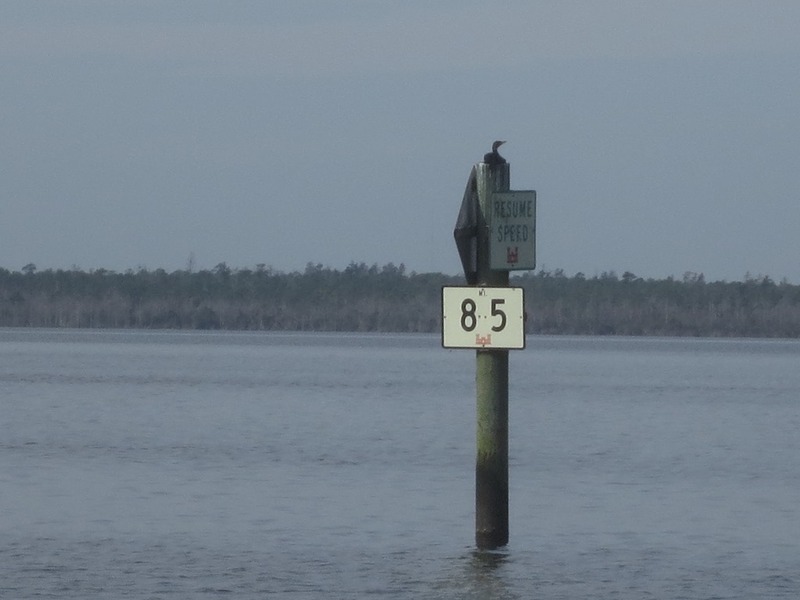 This sign indicates that we are 85 statute (not nautical) miles down the Inter Coastal Waterway (ICW). For reference mile 0 is in Portsmouth, VA.
Its always good to remember that this is not actually the “Love Boat” sailing off to white sand beaches. Somedays we actually get some pretty crappy weather. This is not one of them but just a reminder. We do have a full enclosure and stay completely warm and dry on days like these. 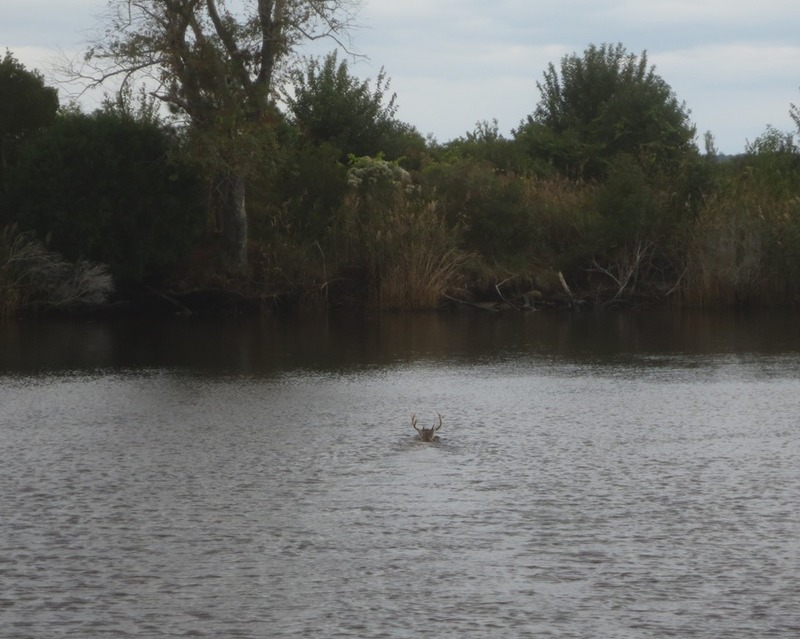 Just about the time the sun came out I observed what I thought was a Sea Monster in the canal. 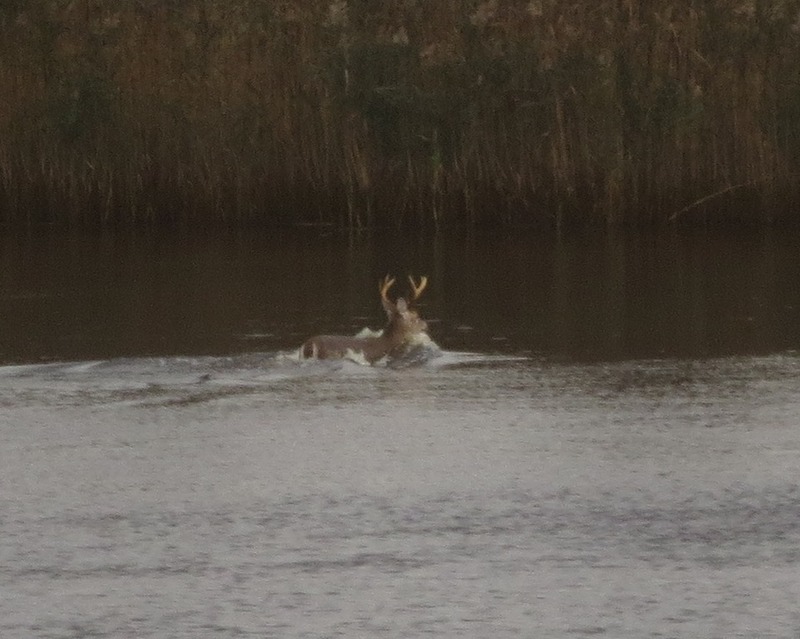 I literally had to slow the boat or I would have hit the poor creature. Watching this guy cross and climb out on the other side really was pretty amazing. 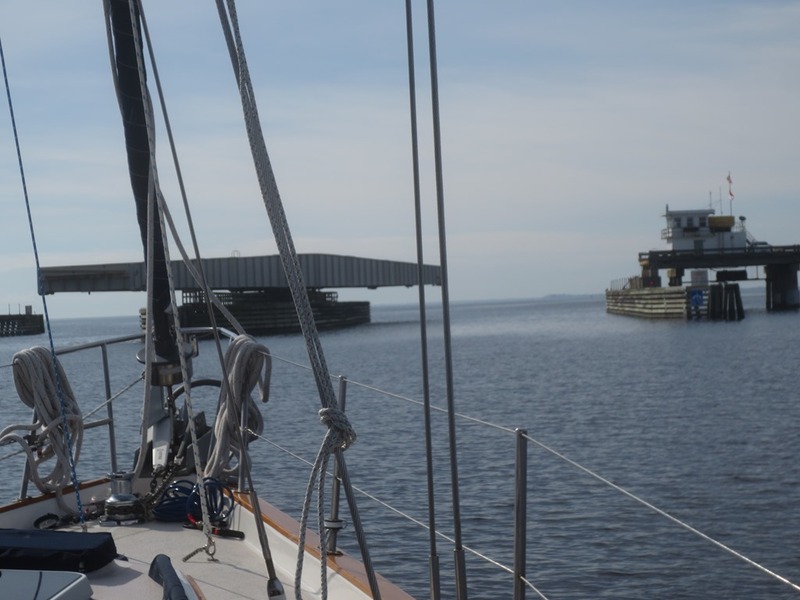 This is a “un-restricted” bridge meaning it is fixed height and we can go under at anytime. 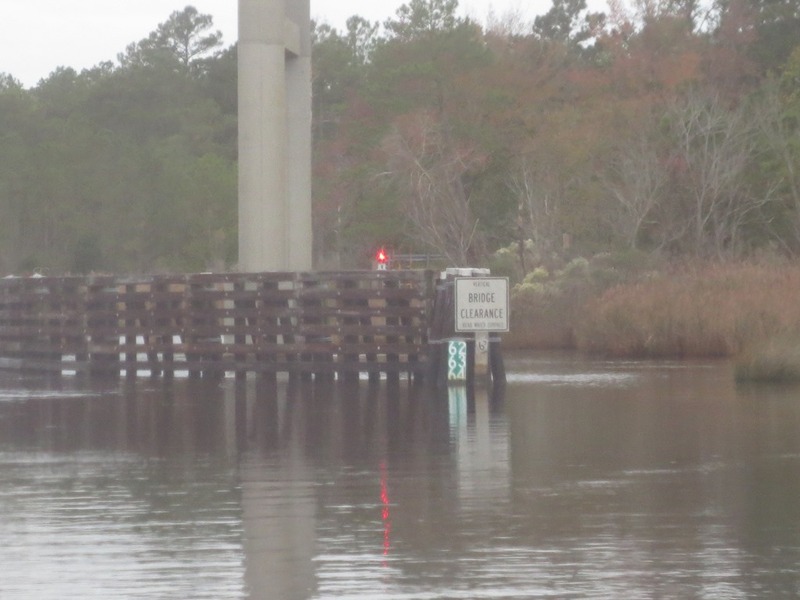 The downside of the bridges is the actually height is governed by how high the water is, As you can see there is a little gauge showing how much clearance we have, I generally grab the binoculars and verify if there is any question on clearance. Magnolia requires 58 ft. The picture below was taken from our track map available at (http://a2baker.com/magnoliablog/?page_id=1602). 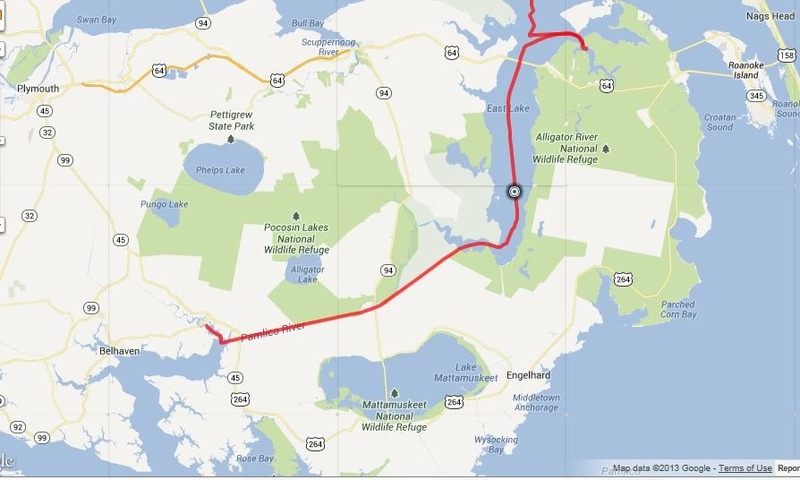 The trip from South Lake to our current anchorage in the Pungo River was 45 nm miles which took us right at 8 hours. We had a bit more current in the canal than I anticipated. 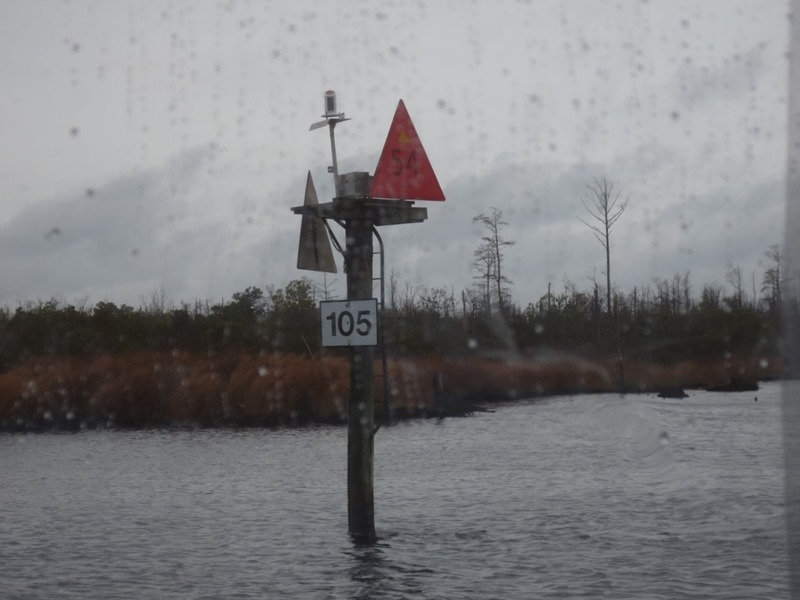 We are anchored deep up the Pungo River until sunday when we will make the short 10 mile hop over to Belhaven Waterway Marina (www.belhavenmarina.com/) to have small Autopilot problem resolved hopefully on Monday. Hope you get the Auropilot fixed Monday so you can get south soon. What, no venison for dinner? And don’t miss the fleas dressed in wedding attire at the Belhaven Museum! I guess the week is young re: seeing unexpected things. Looking forward to museum!